Not sure how comfortable I would feel drenched head-to-toe in liquid/chunk tomato, but apparently this is a THING to do, it’s renowned, worldwide. Have you ever heard of it? Because I never have… so I did a little research. 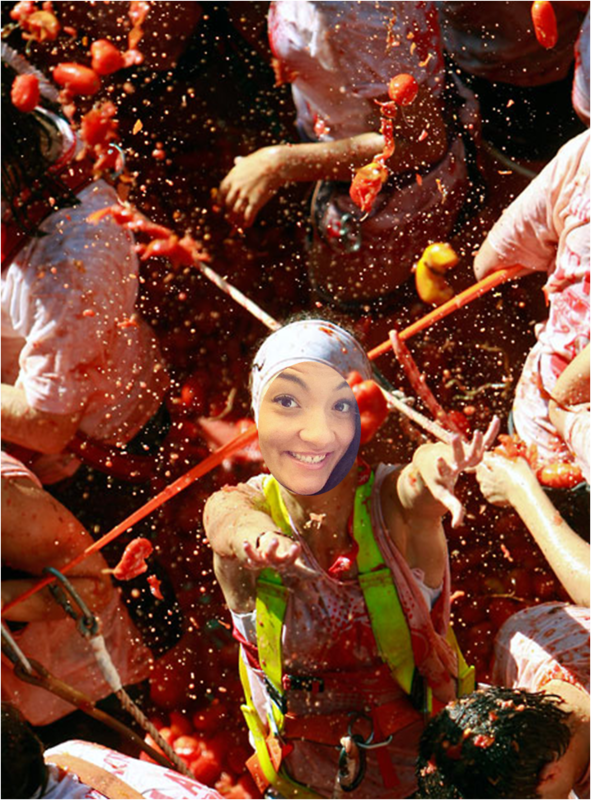 At around 11 am, the first event of the Tomatina begins. Many trucks haul the bounty of tomatoes into the center of the town, Plaza del Pueblo. The tomatoes come from Extremadura, where they are less expensive. Technically the festival does not begin until one brave soul has climbed to the top of a two-story high, greased-up wooden pole and reached the coveted ham at the top. Photos source: telegraph.co.uk “La Tomatina Festival 2012: the annual tomato fight.” < click to see more! If you are planning to take pictures, bring a waterproof camera! Do not miss the Palojabón – a soap-covered pole with a Spanish ham at the top: whoever can climb the pole and get the ham can keep it! Can you see me there?